Temporary (Conical) Strainers are very low cost pipeline strainers that are designed for new system start-up. They offer protection for process equipment against damage causing contamination present during start-up and commissioning. Temporary protection during new system start up and system change outs. Since these strainers are temporary, they need to be installed in a section of pipe such as a removable spool piece. These units should be removed and thrown away after the initial cleaning of the system. 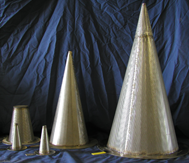 Conical strainers can be manufactured in a range of different configurations to suit your specific requirements. Notes: Please consult the TM Sales Department or your local sales representative for certified drawings, or additional information. information.